WILLEMSTAD - During the summary proceedings against the American oil company ConocoPhillips and the Venezuelan State Oil Company PDVSA filed by three public companies Curoil, Aqualectra and Curaçao Refinery together with the government, PDVSA was not represented. Quincy Carrega represented Curoil in this case; Eric de Vries represented Curaçao Refinery (RdK), CRU and Aqualectra; Rogier van den Heuvel acted on behalf of the government; Jaap Maris and Karel Frielink represented ConocoPhillips and Sandra Thomson acted in this case on behalf of Isla Refinery bv. There was no legal representation for PDVSA. 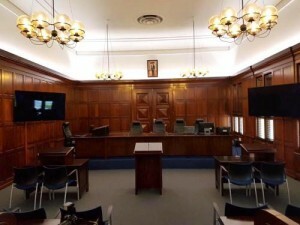 The plaintiffs have one common goal in this case: to lift ConocoPhillips's third-party claim of 2.6 billion dollars and that the Court of First Instance will prohibit other seizures. Parties argue that the country is being harmed by these seizures and that this can have a major negative impact on the country's economy. Isla bv supports the claim for the lifting of the attachment in order to comply with the delivery obligation. The three companies and the government demand in their lawsuit that the Isla refinery immediately resumes fuel deliveries in the usual manner and in accordance with the agreed payment; that PDVSA provides all necessary assistance to the supply of fuel to government-owned companies by Isla; that ConocoPhillips again allows Isla to immediately resume fuel delivery to public utilities in the usual manner and in accordance to the agreed payment; that the liens placed on RdK, Isla, Isla Curazao and Curoil will be lifted; and that ConocoPhillips is forbidden to confiscate, preventing fuel delivery. Finally, a penalty payment is imposed on Isla, PDVSA and ConocoPhillips if one of the stated demands is not met. This involves a penalty payment of 10 million dollars per day or part of a day, with a maximum of 1 billion dollars. The Court will rule on this case on Monda,y May 21.